Trinamool Congress supremo Mamata Banerjee today gave a 24-hour ultimatum to Chief Minister Buddhadeb Bhattacharjee to stop the eviction of poor farmers at Singur by transferring their farmlands to Tata Motors or else she would begin “a fast unto death”. Ruling out reservation based on religion, Union HRD Minister Arjun Singh today said that the UPA government was open to all suggestions, including setting up a central madarasa board to modernise education in seminaries. The Punjab Government has been again put in the dock by the Shiromani Akali Dal (SAD) in connection with a multi-crore mega project. 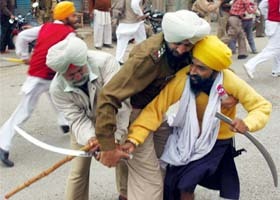 In a no-holds-barred clash, at least five activists of the Shiv Sena (Bal Thackrey) and Shiromani Akali Dal (Amritsar) were injured when they clashed here today. The Commissioner, Railway Safety, Mr R.P.Agarwal, reportedly reached Bhagalpur from Hyderabad today to hold a probe into the train mishap after a 150-year-old road overbridge came crashing down on the sleeper class coach S8 of the 3071 Howrah-Jamalpur Superfast Express yesterday. The bypoll for 11 Assembly seats in 10 states and two Lok Sabha seats in Andhra Pradesh will be held tomorrow in the backdrop of a grudge fight in the Karimnagar parliamentary constituency and the TDP striving to maintain its hold over Bobbili. In the backdrop of India’s assertion that Arunachal Pradesh is its integral part, China has said it favours a “fair, reasonable and mutually acceptable” solution to the vexed border issue. 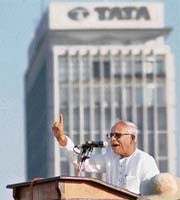 Uttar Pradesh Governor T.V. Rajeshwar today met Union Home Minister Shivraj Patil and is understood to have apprised him about the law and order situation in the state. The Haryana Government has decided to introduce insurance against unseasonable rainfall for wheat crop this rabi season. The Agriculture Minister, Mr. A.S Chatha, has forwarded a proposal to the Chief Minister for clearance.